On the 'back way' up to the Gavel lead mine entrance you walk up the valley with a stream running through it as it drops down the large hill it creates several waterfalls. 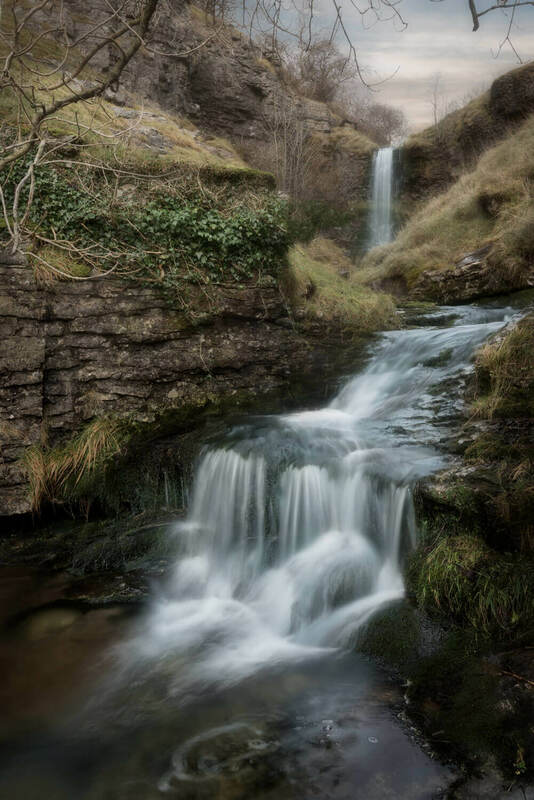 I've taken a few shots of these waterfalls before on there own but they don't look really impressive as there's not masses of water coming down them, but after doing a bit of exploring and trying some different angles I worked out a way of getting two of them in one shot to get a better composed image. The post process on this one is slightly more complicated than my normal process. I started with leveling the shot then focus stacking the shot by focusing in the distance and then re-focusing on the foreground so both are pin sharp. I then shot a series of images with different longer exposures to get the soft water effect. Back home I masked out the focus stacked images to both front and back are sharp, then I dropped the soft water version over the top and again using a mask add the soft water to the stream areas. After I had finished altering the image I applied an Orton effect to it to give it the soft blur effect and then I created a mask and removed some of the soft areas in the foreground.